It doesn’t matter who you are, there comes a day when plans go wrong and spin out of control. It’s guaranteed! When it happens, how should we respond? Did you ever watch the A-Team back in the 80’s? I always looked for Hannibal’s line at the end of the show. No matter how crazy the idea, or what went wrong in the middle, he would say his line, “I love it when a plan comes together. It meant all was good with the world, the bad guys dealt with, and the people they were helping were safe. We like it when our plans work just like we mapped them out. Life is good and it feels like everything is under control. Ultimately, however, we all know that we are not in complete control, it’s just hard to admit it at times. We or someone we love gets sick, the car gets a flat tire, the frig breaks…. Scary, frustrating things happen. While we do not always have control over what happens, we do have control over how we respond to the situation. Our first instinct is to raise the alarm, protest loudly, and insist that things go our way. Because as we all know, our way is the best way. Right? When the bad and frustrating times hit, this is usually the last thing you want to hear. It’s too simple and it sounds cliche. But there is truth in the simplicity and the cliche. That line, it is the answer, but in that moment, it sure doesn’t feel like it. We want to know why? What am I doing wrong? Why is this happening? What about my plans? And then the big one, “But, Lord, I thought I was following your leading and direction!?”. It’s a frustrating question that rarely has a quick answer. Choosing to trust can be a tough decision to make in the midst of it all the stress, especially when we don’t understand. Choosing trust is an act of faith. This one might surprise you… or maybe not! :). Beautiful, small moments that are noticed and appreciated build up over time. Anne Voskamp’s book One Thousand Gifts started as a challenge to make a list of 1,000 things she loved. 1,000 graces. 1,000 things she could be grateful for. It changed her life. These small moments, these small graces are so easily missed, especially in times of stress. 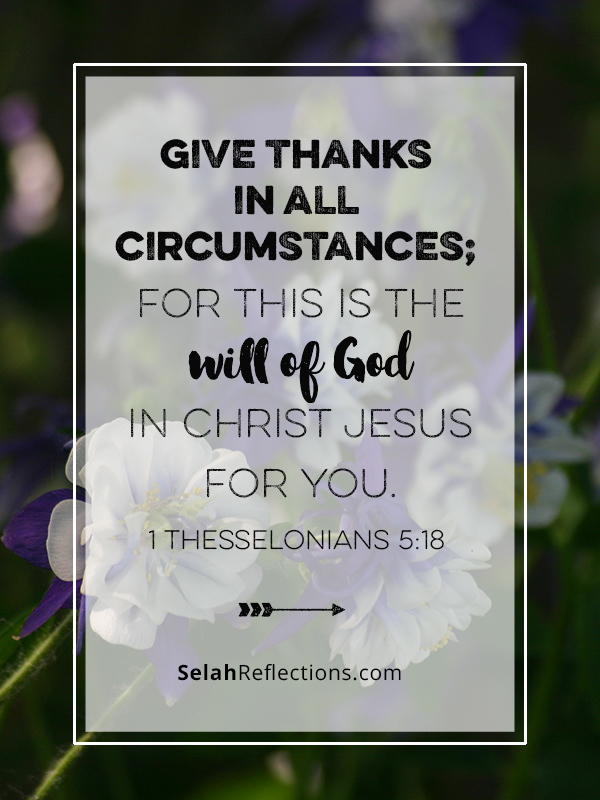 When we take notice, make a list, and record them we start to see a pattern, we can see our Creator, our Provider, in the midst of the good days and the bad. 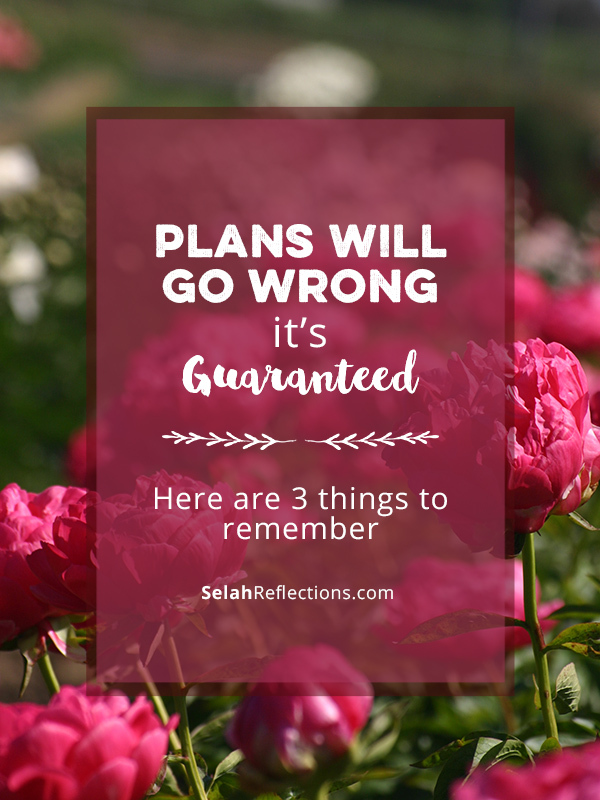 It can change our hearts and minds in the midst of plans going wrong. If things had gone according to our plan, many of these small moments would not have even happened! These 3 things sound so easy don’t they? But they aren’t. Can We Change How We Respond? Yes, I think we can, but not without help. It’s usually something I think about later, after the initial frustration and shock fade and my attempts to control the plan fail. What a different person I would be if these 3 things were my first response. How would my life, my testimony, my example, and my impact change? I want to leave you with one last thought. It’s guaranteed that plans are going to go wrong. We are going to get the bad news that we don’t respond correctly too. There will be times when we are going to respond in fear, anger, frustration, and confusion. And probably will feel guilty about it later. Thankfully we have a God who understands and can handle it. He knows our weaknesses and when we ask, He forgives freely. He never leaves us or forsakes us. I’ll never forget the first time I read that, it made me stop and think. Now, I’m not saying this is theologically sound… what I am saying is that we are told to cast our cares (our worries, our anxieties, our messed up plans) on Him, because He cares for us. He is the one that can take our frustration, fear, and anger and transform it, transform us. He is the one who can take up our messed up plans and turn it into something better than we ever imagined. Is it your fight or God’s?